Product SKU: 34748 ID: p31x12. Rockford Fosgate P3-1X12 Punch 12 P3 Loaded Enclosure. 1200W Peak (600W RMS) Single P3D2-12 12 Punch P3 Series Loaded and Wired Subwoofer Enclosure. 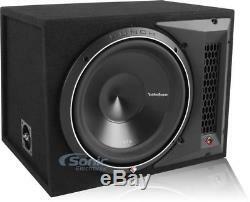 12 Dual 2 ohm Punch Stage 3 Subwoofer. StampCast basket with integrated spider venting. Sturdy 16 gauge compound bend frame geometry. High modulus Kevlar re-inforced paper-pulp cone. Semi-flexible, PVC removable protective motor cover. Multi-point high-temp/high-strength neck joint bonding technique. Tall-profile VAST Santoprene surround for larger surface area. Dual tear & fatigue resistant poly-cotton spider with woven tinsel leads. Fatigue resistant and reduced strain "stitched on" flexible lead wire design. Proprietary all metal, radially oriented compression input terminal assembly. Optimized motor magnetics with extended pole and bumped vented backplate. High temp 2.5 voice coil w/ spun-laced Nomex insulating re-inforcement collar. Die-Cast aluminum soft-touch painted trim ring allows for optional integrated grill. Stamped Mesh Grille Insert Available: Rockford Fosgate P2P3G-12. Frequency Response: 26.5 - 250 Hz. Single Punch P3 12 Loaded Subwoofer Enclosure. Loaded woofer is internally wired to a final impedance of 1 ohm. Constructed with durable 5/8 MDF. 26.5 - 250 Hz. Get the best sound out of your new pre-enclosed subwoofer with some high grade speaker wire. The higher the quality of the speaker wire, the better the subwoofer will sound. Of True 12 Gauge EnvyFlex Speaker Cable/Wire (100% Oxygen-Free Copper). Get the most sound out of your new subwoofer with some high quality sound dampening material. It will keep the road noise out and the music inside the car. NVX Sound Dampening Trunk Kit (SDTK20). 20 Square Feet of Sound Dampening Material (Five 18" x 32" Pieces). NVX Sound Dampening Rubber Roller (SDRLR1). Universal, Professional Heavy Duty Roller for Sound Damping/Dampening. Make installation for your new enclosure simple with these tools. Designed to cut, crimp, screw, remove panels, and do just about everything you need to get your system up and running. Car Stereo and Speaker Installation Tool Kit. Complete Car Stereo Tool Kit, Includes Voltage Test Light, Wire Stripper and More. Policies for US and Canadian Customers. Return for replacement within: 30 days. Defective Merchandise Merchandise that is discovered to be defective upon receipt will be replaced. Damaged Merchandise All packages are inspected for damage prior to leaving our warehouse. Damaged merchandise can be replaced with the same model only. Replacement Terms We will send a product replacement for an authorized return following the completion of receiving and inspection at our facility. You will be required to complete our product return form which will also provide helpful instructions for your return. Battery, charger, cords, straps, etc. We will not process the return if any of these conditions are not followed. Any product without a valid, readable serial number, including but not limited to products with missing, damaged, altered, or otherwise unreadable serial number. Any product from which the UPC code has been removed from its packaging. Any product that exhibits physical damage or abuse. Products that are not eligible for return for any of the above reason(s) will be sent back to you at your cost and expense. Return to top of policies. Unit B, Sylmar, CA 91342 USA. Prices, specifications, and images are subject to change without notice. The item "NEW Rockford Fosgate P3-1X12 12 Punch Loaded Car Subwoofer Box 1200 Watt Sub" is in sale since Friday, February 23, 2018. This item is in the category "Consumer Electronics\Vehicle Electronics & GPS\Car Audio\Car Subwoofers".